Dr. Riccio was born in New Haven and currently lives in Branford. He graduated in 1970 from Hamden Hall high school. He went to the West Point Military Academy out of high school where he was injured and received an honorable medical discharge from the Army. Dr. Riccio then attended Emory University in Atlanta, GA graduating in 1974. He graduated in 1978 from the Medical School at Wake Forest University in Winston Salem, North Carolina. Dr. Riccio did his residency training at Hospital of St. Raphael’s in Internal medicine from 1978 and completed in 1981. He went into private practice in East Haven in 1981. 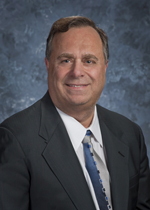 Dr. Riccio is currently the Medical Doctor/Director for the public school system of East Haven. He is also the Medical Doctor/Director for Hamden Hall Country Day School and the varsity football team. He was team doctor for the varsity football team of East Haven from 1981 to 1994.